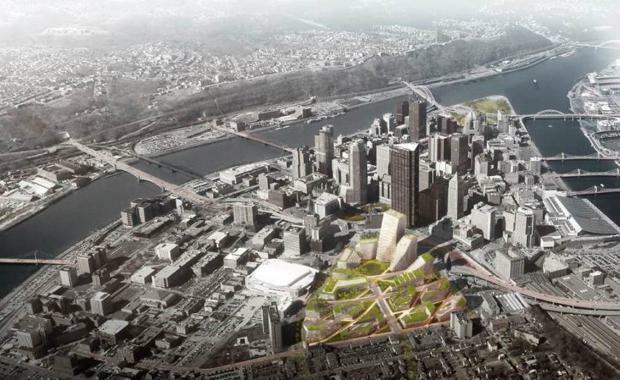 Pittsburgh in the US is set to receive a dramatic transformation with the unveiling of plans for a new urban development in the heart of the city. Danish architecture firm BIG, West 8 Urban Design and Architecture and environmental design consultants Atelier Ten have released renders of a new urban neighbourhood that will be built on the Civic Arena site, the former home of the city's professional hockey franchise the Penguins, in the CBD. The arena, built in 1961, was demolished in 2012. Covering over 28 acres, the new Lower Hill Master Plan features 1,200 homes as well as over one million square feet of retail and commerce space. Mayor of Pitsburgh Bill Peduto said of the new neighbourhood: “It’s about how adding on to what we have, which is already incredibly special, and building something for the next 50 years." Under the Master Plan, the neighbourhood will be built around a 'public realm' that will connect the Hill District to the downtown area. The public realm features granite outcroppings inspired by the region's Allegheny landscape and follows a daylit storm system that encourages discovery and play. There will also be a network of criss crossing pathways and triangular plazas. “The masterplan for the Lower Hill District is created by supplementing the existing street grid with a new network of parks and paths shaped to optimise the sloping hill side for human accessibility for all generations," BIG founding partner Bjarke Ingels said. "The paths are turned and twisted to always find a gentle sloping path leading pedestrians and bicyclists comfortably up and down the hillside. The resulting urban fabric combines a green network of effortless circulation with a quirky character reminiscent of a historical downtown. Topography and accessibility merging to create a unique new part of Pittsburgh. "West 8 partner Jamie Maslyn added: "The site, with its slopes and views, is perfectly suited for bringing an experience of the native landscape to this urban condition. The design creates a new open space identity but more importantly gives neighbors and visitors the sensations of nature in the heart of the city." Residential buildings will have terraced roofs to allow access to outdoor areas and to encourage a sense of community. Atelier Ten has also developed a set of comprehensive sustainable goals that consider district scaled heating and cooling opportunities, retaining all rainwater on the site and utilising it for irrigation of the public space.